"You will found a new order, and you will be my witnesses throughout the world. This is your name: Servants of Mary. This is your rule: that of Saint Augustine. And here is your distinctive sign: the black scapular, in memory of my sufferings." 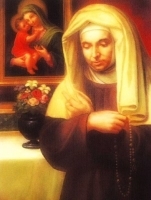 From their first establishment at La Camarzia, near Florence, Italy, they removed to the more secluded Monte Senario where the Blessed Virgin herself conferred on them their habit, instructing them to follow the Rule of Saint Augustine and to admit associates. Official approval was obtained in 1249; confirmed in 1256; suppressed in 1276; definitely approved in 1304; and again by Brief in 1928. The order was so rapidly diffused that by 1285 there were 10,000 members with houses in Germany, France, Italy, and Spain, and early in the 14th century it numbered 100 convents, besides missions in Crete and India. The Reformation reduced the order in Germany, but it flourished elsewhere. Again meeting with political reverses in the late 18th and early 19th centuries, it nevertheless prospered, being established in England in 1867, and in America in 1870. The Servites take solemn vows and venerate in a special manner the Seven Dolors of Our Lady. They cultivate both the interior and the active life, giving missions and teaching. An affiliation, professing exclusively the contemplative life is that of the Hermits of Monte Senario. Reinstated in France, 1922. Cloistered nuns, forming a Second Order, have been affiliated with the Servites since 1619 when Blessed Benedicta di Rossi called the nuns of her community Servite Hermitesses. They have been established in England, Spain, Italy, the Tyrol, and Germany. A Third Order, the Mantellate, founded by Saint Juliana Falconieri under Saint Philip Benizi, c.1284, has houses in Italy, France, Spain, England, Canada, and the United States. Secular tertiaries and a confraternity of the Seven Dolors are other branches. The second child of Giovanni Battista Carboni and Maria Domenica Pinna, Edvige had to leave school at the 4th grade. She felt drawn to the religious life, but stayed at her parents’ home to care for her chronically ill mother; she spent all her free time there in prayer. On 14 July 1911 she received the signs of the stigmata; she tried to hide it and the blood stains that resulted, but it soon became obvious. She moved to Rome, Italy just prior to the outbreak of World War II; she spent the war years working with charities and praying for all the dead. She reported apparitions of Jesus Christ, Saint Anne, Saint Catherine of Siena, Saint Dominic Savio, Saint Francis of Assisi, Saint Gemma Galgani, Saint Genaro of Naples, Saint John Bosco, Saint Paul the Apostle, Saint Rita of Cascia, Saint Sebastian, Saint Thérèse of Lisieux, and attacks by demons. Born to the Italian nobility. Brought into the Franciscans by Saint Anthony of Padua and Saint Francis of Assisi. Anthony's companion in his travels and preaching, tending to him in his last days and taking Anthony's place upon his death. Guardian of the Friars Minor in the city of Padua. In 1239 Padua fell, nobles were executed, the mayor and council banished, the university of Padua closed, and the church dedicated to Saint Anthony left unfinished. Luke was expelled, but secretly returned, visiting the tomb of Saint Anthony to pray for help. One night a voice from the tomb assured him that the city would soon be delivered; it was. Luke was elected provincial minister, and furthered the completion of the great basilica in honor of Anthony. Founded convents. Miracle worker. One of the Seven Founders of the Servants of Mary; uncle of Saint Juliana Falconieri. Son of Bernard Falconieri, a wealthy Florentine merchant and a Guelph. Joined the Laudesi, also known as the Praisers of Mary, a confraternity of the Blessed Virgin in Florence, Italy c.1225, and in this group met the others who would be the Servite Founders. Received the vision of Mary on 15 August 1233. The other members of the Laudesi were ordained, but Alexis felt himself unworthy, remained a lay-brother, and worked to insure the material and financial requirements of the community, often begging in the street when he had no other resources. Helped build the Servite church at Cafaggio. He was the only one of the seven founders still alive when the Order was approved by Pope Benedict XI in 1304. Joined the Franciscan Capuchins on 21 November 1886 in Arenys de Mar, Spain. Ordained on 24 June 1901. Extremely popular preacher. Superior of monasteries in Igualada and Arenys de Mar, Spain. Capuchin visitator of Central America. Provincial superior of his Order. Arrested on 16 February 1937 in a residence where he was hiding from anti-Catholic Marxists forces during the Spanish Civil War; as soon as they determined that he was a priest, he was murdered. Martyr. 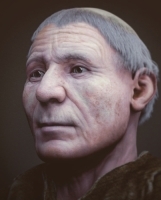 Silvinus spent his youth in the courts of King Childeric II and King Thierry III. On the eve of his marriage, he left for a pilgrimage to the Holy Land, and decided to turn his back on worldly life. Priest, ordained in Rome, Italy. Regional bishop with his see in Toulouse. Successful travelling evangelist in the area around Thérouanne and Toulouse, and throughout the region that is modern Belgium. Ransomed slaves. In later life he retired to become a Benedictine monk at the abbey of Auchy-les-Moines, Artois, France. Spiritual student of Saint Columba. Austere hermit at Clonenagh, Ireland. Many would-be students gathered around him that he founded a house for them and served as their abbot. He set such an austere example that neighboring monasteries complained they could not keep up; though he was very severe on himself, Fintan was known to be gentle and forgiving with others. Spiritual teacher of Saint Comgall of Bangor. Legend says that Fintan's mother received an angelic visit to explain what a holy son she would have. Fintan was reputed to have the gifts of prophecy and knowledge of distant events. Witnesses say that when he prayed by himself, he was surrounded by light. 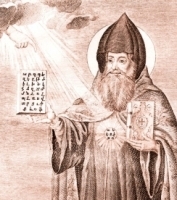 Patriarch of Constantinople c.446. He condemned Eutyches, who began the heresy of Monophysitism. He refused to bribe Emperor Theodosius II in order to hold his see, and, against Theodosius's wishes, he made the emperor's sister Pulcherius a deaconess. Theodosius had him deposed and exiled. When Flavian tried to appeal Pope Leo the Great to hold his seat, the emperor had him beaten so badly that he died three days later from his wounds. Career soldier who retired from the military to become a hermit, monk and preacher. Worked with Saint Isaac the Great in the formation of the Armenian Church. Civil servant. Missionary to Armenia and Georgia. Developed the alphabet for writing Armenian. Organized schools and the translation of the Bible into Armenian, translating the New Testament himself. Monk at Iona. Succeeded Saint Aidan of Lindisfarne as governor of the Church in Northumbria, England. Bishop of Lindesfarne, England in 651. Built the cathedral, and the monasteries of Gilling and Whitby. Opposed the replacement of the Celtic liturgy with the Roman one. Evangelized southern England, working with Saint Cedd. Friend of King Oswiu of Northumbria and Saint Cuthbert of Lindisfarne. Baptized King Penda and King Saint Sigebert of the East Saxons, and brought Saint Ebbe the Elder into the Benedictines. 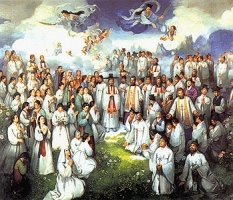 Married layman and father in the apostolic vicariate of Korea. While reading the Bible to a group of friends at the home of a catechist one night, he was arrested, imprisoned and murdered for the offense of teaching Christianity. Martyr. 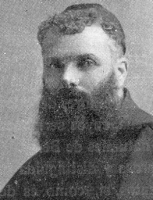 One of the Seven Founders of Servants of Mary (Servites). Governed the important Servite convent of Carfaggio. Third general of the Servites. In his later years he retired to spend his final days at the monastery at Monte Sennario, Italy. Benedictine monk under Saint Leo at Cava monastery, Salerno, Italy. Abbot of Cava in 1122. Built the town of Castelabbate around the monastery. Married lay women in the dioceses of Rome and Sassari, Italy. Widow. Member of the Secular Franciscan Order, and of the Union of the Catholic Apostolate. One of the Seven Founders of the Servants of Mary. Attended the Council of Lyons in 1246. Governed the Servites in the Tuscan province in 1260. Took the Servite Order to France at the request of King Saint Louis IX. Fourth prior-general of the Servites. Sent missionaries to Asia. Retired to turn authority over to Saint Philip Benizi. One of the Seven Founders of Servants of Mary. The youngest of the Founders. Elected as the second prior-general of the Servites in 1256. Priest. Member of the Marians of the Immaculate Conception. One of the 108 Polish Martyrs of World War II. One of the Seven Founders of the Servants of Mary. Worked with Saint Philip Benizi in France and Germany. Vicar-general of the Servites in Germany for eight years. One of the Seven Founders of the Servants of Mary. Led the Servite province of Umbria, Italy from 1260 until his death, and brought the Servite Order to Germany. Priest. Imprisoned c.353 for supporting his bishop, Saint Paulinus, and orthodox Christianity in the face of Arians. Bishop of Trier, Gaul (in modern Germany) in 358; he continued to fight Arianism. Benedictine monk at Cagliari, Sardinia. Bishop of Dolia, Sardinia for five years. Shortly before his death he resigned his see, and spent his last days as a prayerful recluse at the basilica abbey. Sixth century Briton. Friend and travelling companion of Saint Tudwal. Abbot at Loc-Kirec, Brittany. Assisted bishop Saint Paul of Léon. The son of a pagan chieftain, he was converted to Christianity by Saint Loman of Trim. Sixth century bishop of Trim, Ireland. Hermit. Catechumen at Caesarea, Palestine. Arrested for venerating the martyred Saint Elias and companions. Martyred by order of Firmilian, governor of Palestine. Member of the household of the governor of Palestine. When the governor learned of Theodulus's Christianity, he ordered his execution. Martyr. One of a group of over 80 Christians martyred together during the persecutions Diocletian. Priest. Evangelized with Saint Norbert. 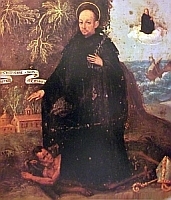 Abbot of Gottesgnaden and Magdeburg. Bishop of Ratzeburg, Germany. Bishop of Luna, Tuscany, an Italian city which exists now only in ruins. Martyred by Arian Vandals. 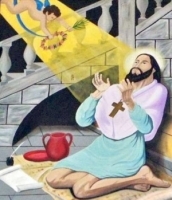 The only one of a group of 45 Christian martyrs whose name has come down to us. Baptized by Saint Hilary of Poitiers c.360, and died within the week. Saint Gregory of Tours wrote about him.